3M 725 Wrist Strap Monitor Kit USED. Contains everything shown in pictures. Refrigerator/Freezer guard from Temperature Guard. Set to network and sends out alarms when refrigeration is not working properly. We have been using it for about 2-3 years now, and letting go of it because we recently upgraded our refrigeration system with an internal monitoring. WE TAKE CREDIT CARDS-1 Year Warranty. We have no responsibilities or liabilities for manufacture, installation or use of these products. Fan Monitor. This product is new and unused. This is unused unopened surplus. We will do our best to rectify any issues. NEW -OLD INVENTORY. MPN:Series AY. New, In working condition.This item is New. Phone: 419-266-9216. TOUCH MONITOR LCD. 17" TOUCH SCREEN. 17 LB EFG 4/5/2014. When we receive the product we will confirm item is defective, has not been disassembled and our seal is intact. 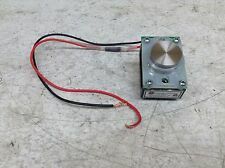 SOUTHBENDINDUSTRIAL, INC.
3PHASE OVER/UNDER VOLT MONITOR, #DPB01CM48. Condition is New. Shipped with USPS First Class Package. Send us your list of surplus for a price! Ask us for any electronic repairs you may need, or google us for a repair quote. Our in house technicians refurbish a wide range of high failure, obsolete parts such as: AC/DC Servo Drives, Amplifiers, Touch Screens/ HMI's, Power Supplies, PLC's, Sensors, and virtually any industrial Circuit Boards. This listing is for a PCM bit synchronizer. Manufacturer: Aydin Monitor Systems Model: 335A-12-20-30 P/N: 356-0181-501 . Shipping is always free with me, so please buy as much as you like. Feedback is very important to me. Please contact me with any questions or concerns you may have. Tatung Co. Model # TBM-1203. Accuracy – Dynamic performance data min. UnitI∆P,max Max. table 24 with UPD=UAC √2 1414 VPEAK. These units were taken out of a machine no longer in service and are in good working condition. Category:PCB Circuit Boards. Revision:REV C. Fuse Holder. Circuit Breakers. Flow Indicators. Plug Valves. Pneumatic Exhaust Valves. Motor Drives. We strive for excellence and appreciate the. All pictures are taken in house. opportunity to work with you in resolving any issues. Since we're a liquidation house that deals with many vendors and have thousands of products online, it. Mitsubishi CRT / Monitor #2308T831. INDUSTRIAL SCIENTIFIC MULTI-GAS MONITOR MODEL LTX312 W/ CARRING CASE (FOR AMMONIA ONLY) USED TRAY D B2W/LABEL. 22" 1080p DVI Dell Monitor with Height-Adjust Stand Tested Working. Condition is Used. Shipped with USPS Priority Mail. You are buying (1) MAGNET LOAD MONITOR - SERIES FS ERIEZ 1 yr warranty. We have no responsibilities or liabilities for manufacture, installation or use of these products. WE TAKE CREDIT CARDS -1 Year Warranty. Digital Monitor. Graphic Display Variable Frequency Drive. We have no responsibilities or liabilities for manufacture, installation or use of these products. WE TAKE CREDIT CARDS-2 Year Warranty. WE TAKE CREDIT CARDS- 2 Year Warranty. We have no responsibilities or liabilities for manufacture, installation or use of these products. Model: GACA94V0 B0810 D. You are Purchasing a Integral RTD Monitor Circuit Board. New Air Monitor Exactor 330 Series differential pressure transmitter! Call for better pricing! Condition: New other (see details). 4 Edwards model 1570 pressure monitor analog, used, untested, view pictures for more details. Air Monitor Corportion. Air Monitor. Part # 8-002-00. You are buying (1) ThermoScientific 61-200-1 Motion Monitor 1 Year Warranty. 1 Year Warranty. We Take credit cards. We have no responsibilities or liabilities for manufacture, installation or use of these products. AIR MONITOR CORP SERIES 330 DIFFERENTIAL PRESSURE TRANSMITTER. SEE PHOTOS. We always strive to resolve any issue. We have a great selection of. and other industrial maintenance parts. We specialize in. ~ ~ 35313291A ~ ~. Tested: Powers on, unable to test further.